Hopping John is a New Year’s tradition that has survived relatively unchanged since the mid-19th Century. Specifically a Carolina tradition, the dish is relatively simple, with a strong African influence. And typical of many traditional dishes, it’s not pretty. It’s “real food”, not pretty food. But if you’ve had this dish, it’s quite likely you may have come away unimpressed, as modern versions tend to be mushy. And unsurprisingly, the ingredients are the key here. Modern versions use black eyed peas, but the original versions call for red peas, also called cowpeas. 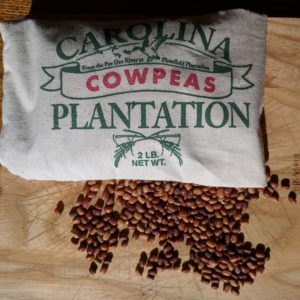 While black eyed peas and cowpeas are in the same family of beans, the difference is significant, cowpeas cook up much firmer, and tend not to get mushy at all, even after reheating. The biggest problem for the modern cook, is where to get red cowpeas. At this time, the only source I’ve found for them is Carolina Plantation. Reading the recipe here can be a bit confusing. Not uncommonly, the recipe backtracks, sort of like putting your comments at the end without actually signifying they are comments. The basic order of the recipe is, Add the peas and a quart of water to the pot, boil until the peas are halfway done. Add the bacon and cook until the peas are done. The halfway point is also a good time to add seasoning. Now add the rice, cook an additional 30 minutes, then put on low heat to complete the cooking of the rice. Now, for another ingredient issue. The bacon of the 19th century was pretty much nothing like the bacon of today. The bacon of the time was leaner, probably cut higher on the hog, and was dry-cured and smoked. Honestly, unless you have an in with a shop that does traditional curing, the best option I’ve found is smoked ham hocks. Now, since I had that nice ham hock, what I did was to cut the meat from it, then simmer it for a while in a little more than a quart of water to make a ham stock, that I then cooked the beans in. No point in wasting any ham flavor! Soak cowpeas overnight in enough water to cover. Drain and discard water. Cut meat from the ham hock, set aside. If desired, make stock from hock bone (see notes). Place peas and 1 quart of water in a pot, and boil until peas just begin to get soft. Add chopped ham, pepper to taste, and continue cooking until peas are tender enough to eat. Add rice, salt to taste and mint if using, stir into the beans, simmer for 30 minutes. If necessary, add additional boiling water. Whether you add water will depend on how long it cooks, how tight the lid of your pot is, etc. Drop heat to low, and hold until rice has steamed and is done. Remove ham from pot, cut into bite sized pieces. 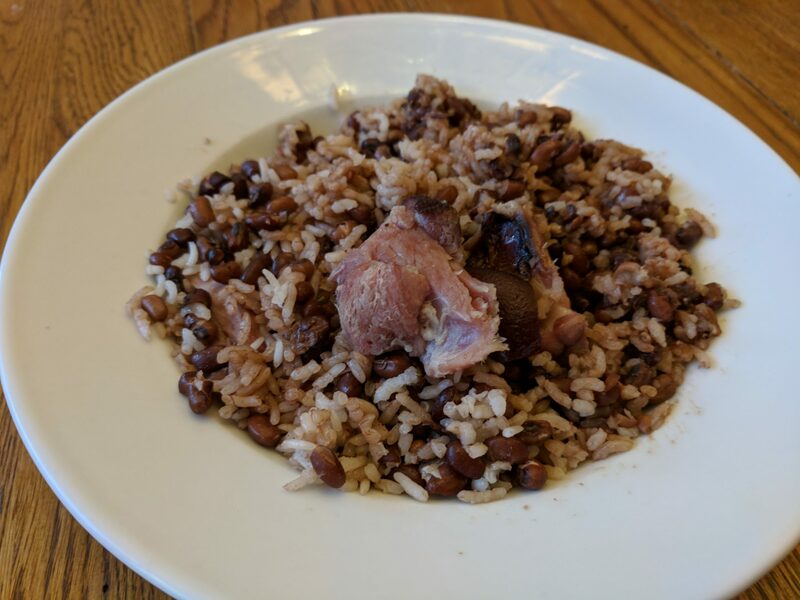 Serve beans and rice with ham on top. If you wish to make this with a ham stock instead of plain water. Just drop your hock bones into the pot with the water, and simmer for a couple hours. Then remove the bones, strain, and cook the peas in the liquid. If you want to make a vegetarian version, skip the ham hock, but I would suggest using vegetable stock instead of plain water. Maybe an onion in the pot for flavor? 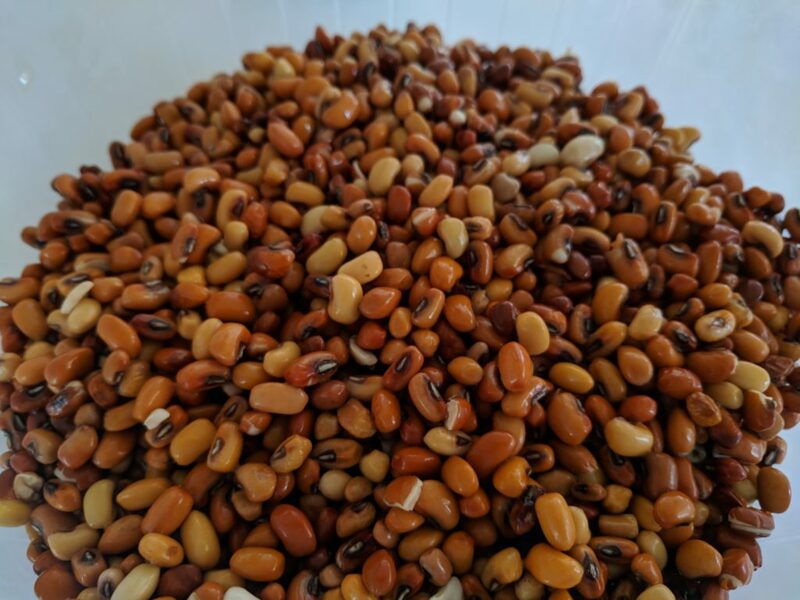 If you cannot get cowpeas, you can use black eyed peas, but you will have to be very careful not to overcook them, as they will cook to mush if overcooked. Cooking time is pretty variable here, depending on your beans. With the cowpeas, my cooking time before adding the rice was approximately 2-1/2 hours. When using ham, you may not need to use salt at all. S. Rutledge, House and Home: or The Carolina Housewife. Charleston, S.C.: John Russell, 1855.